IMPORTANT: This product involves the hardware and a USB manual. We ship it all to you. It's that simple. Click Add-to-Cart button above for a secure safe purchase! 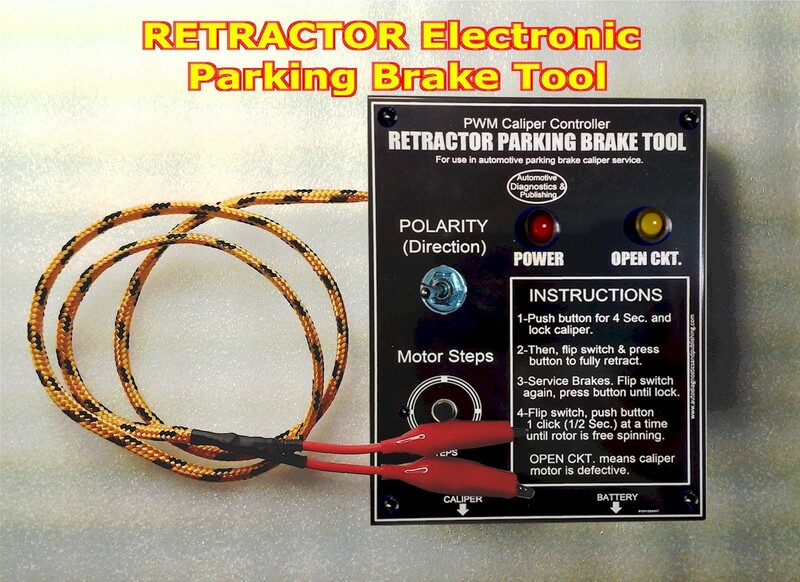 What is Electronic Parking Brake? Almost any automotive make today is moving towards the use of EPB or Electronic Parking Brakes. Why? It's simple, because the system is simpler to make and can be adapted with extra features with just software, like uphill brake hold. 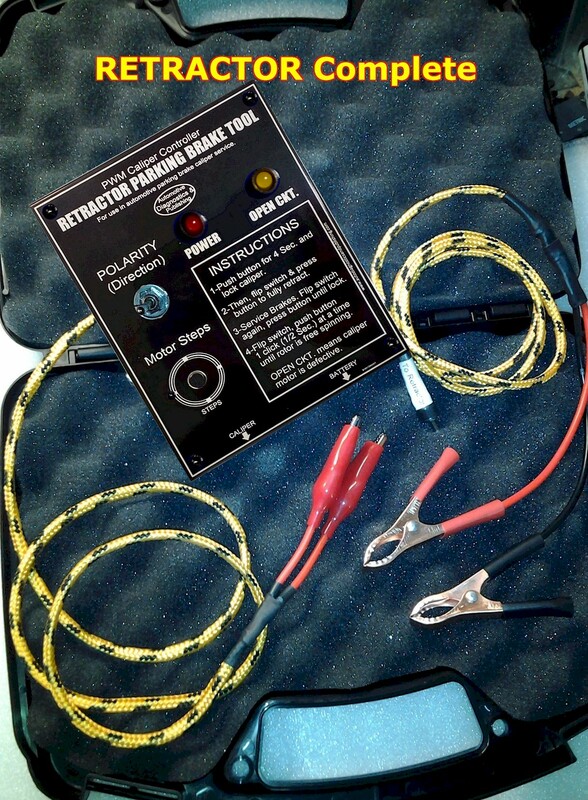 These systems employ an electrically geared operated brake caliper in embedded to a normal hydraulic unit. So the system works like a normal hydraulic caliper, but also has a motor controlled mechanism using gears to advance the caliper piston further mechanically. In this way, it effects the parking brake. The EPB system is computer controlled. In other words, there is a two terminal CD Motor controlled by the computer. The computer/module reverses polarity to retract or contract the caliper as needed. Why is the RETRACTOR the best choice. There are various other EPB Tools available, mostly for VW/Audi systems like the VAG scanners and tools. These are fine, but not the best choice. Why? It is simple, the RETRACTOR EPB Tool provides the highest current possible needed to operate the motor. Often, these motors momentarily seize internally due to debris and plain wear. The car's computer may not provide the needed current to retract the caliper when "Doing A Brake-Job". There may not be anything wrong with the caliper itself, it's gears are used to be in one position for a long time and need a little help. That's where the RETRACTOR EPB Tool is king. 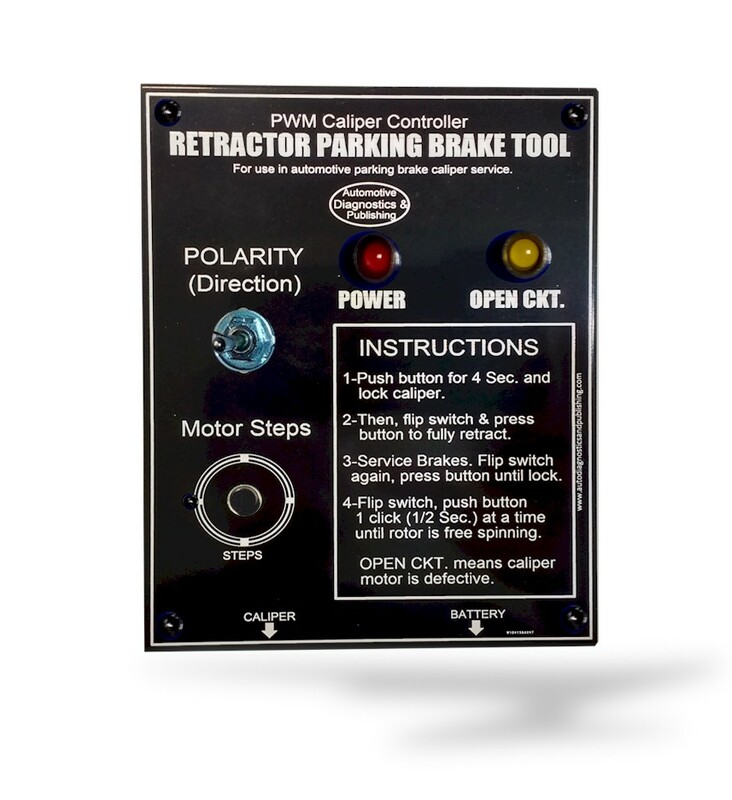 The RETRACTOR "EPB" Electronic Parking Brake Tool has industry dedicated microprocessor and DRIVER transistors made exclusively for DC Motor Control. Simply put, the electronics inside the RETRACTOR EPB Tool is the best money can buy and too expensive for most car manufacturers to use, unless they're high end models. 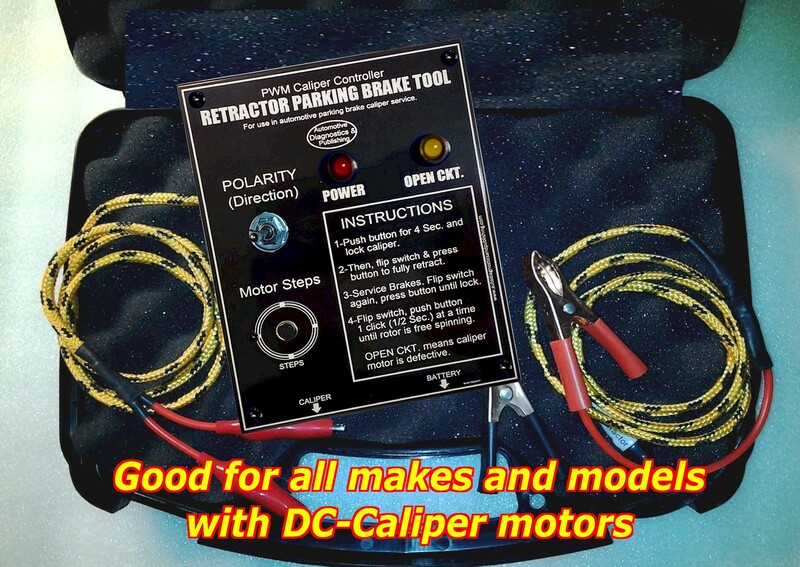 The RETRACTOR EPB (Electronic Parking Brake) Tool is also made for any and all cars that use a DC Motor for the EPB calipers. To this day, they are all using DC Motors for the EPB calipers. There may come a day when car makers start using "Stepper" motors for these calipers, but not yet and there's no reason for that. As we've explained before, these systems use a variable polarity/direction DC motor. Is it necessary to reset these EPB systems after a brake job? Not necessarily if you've done the procedure right and here's why. The EPB system uses a two terminal DC Motor and no position sensor. The computer has no idea where the caliper piston is at. It infers a position by "Ripple Counting" the motor actuation. So, every time the caliper DC Motor retract and contracts fully, the EPB computer counts the motor commutator ripples and more or less determines the caliper piston position. In actuality, all car makers do provide a way to reset the caliper "WITHOUT" a scanner, even VW Audi. But even if you don't, the system does a functionality check any time you start the car. Why? Because as explained, inferring the caliper piston position from counting motor ripple is not accurate. Furthermore, if you follow the proper procedure for the RETRACTOR, it'll be as if you were never there. Yes, that's right, with the RETRACTOR is as if you were never there. The RETRACTOR EPB Tool has a PUSH Knob for fast motor actuation and also a super ACCURATE DIGITAL turning encoder control knob for "Step-By-Step" DC Motor actuation. 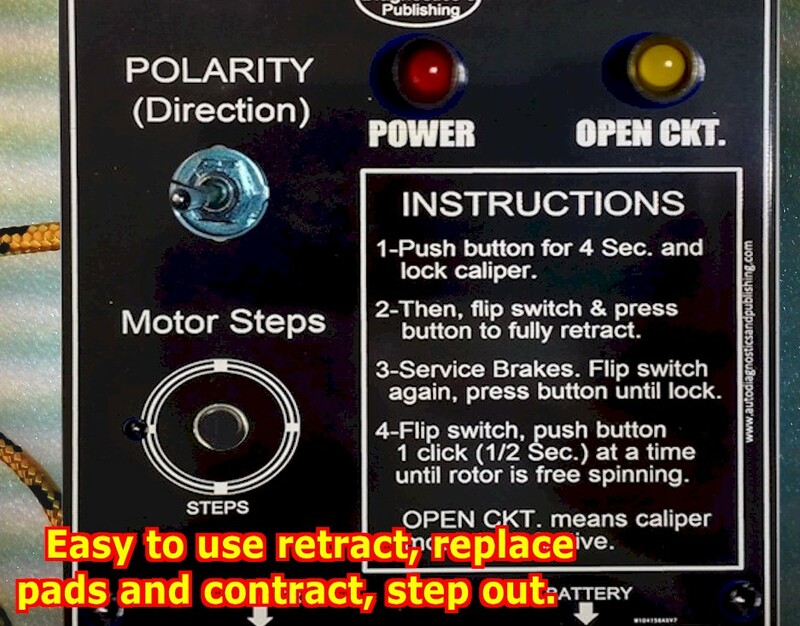 Turning the knob will rotate the DC Motor "At FULL CURRENT" by about 1/12 of a full turn. This is enough to finely adjust the pad to rotor clearance. As we've mentioned before, "As if you were never there". Finally, the RETRACTOR EPB Tool also has specific electronics that monitors the current flow through the DC Motor. In essence, this tool will not let excessive current flow at the DC Motor, thereby, protecting it. Other driver circuits that control DC motors, employ a transistor driver. The RETRACTOR electronics is microprocessor controlled, like having a monitoring current probe at the DC motor. 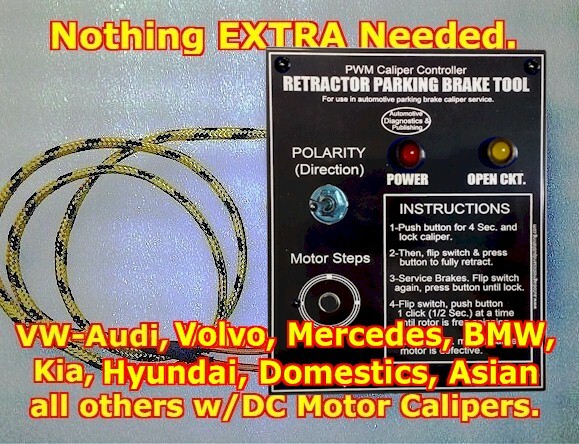 No other electronic parking brake motor testing tool has this much technology in it. The RETRACTOR EPB Tool comes complete, with all cables, operator's manual on CD ROM, and plastic carrying case. 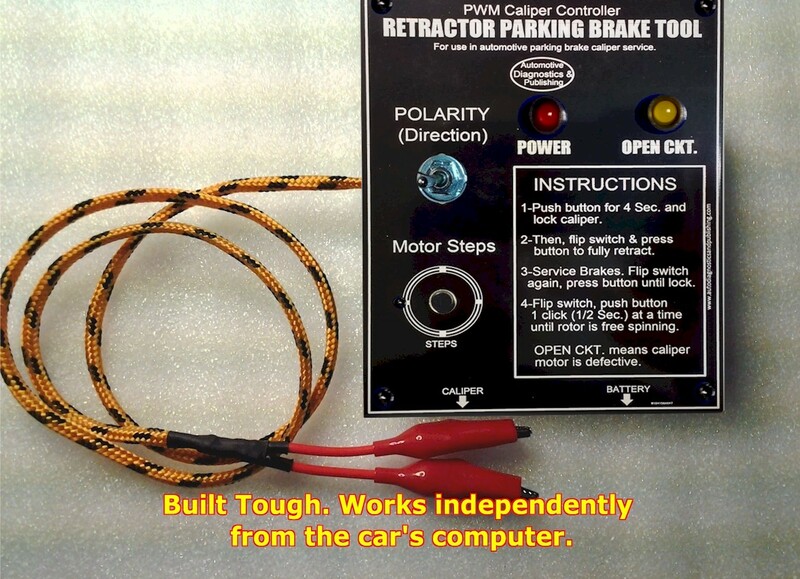 A complete electronic parking brake retraction tool.